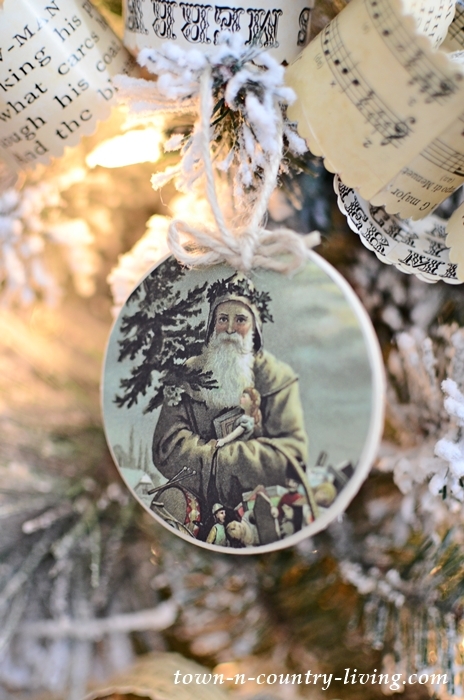 I found the vintage Santa illustrations at The Graphics Fairy and cropped them into circles for ornaments. They’re hanging on my small flocked tree in the family room. Download the circle Santa prints and cut them out. 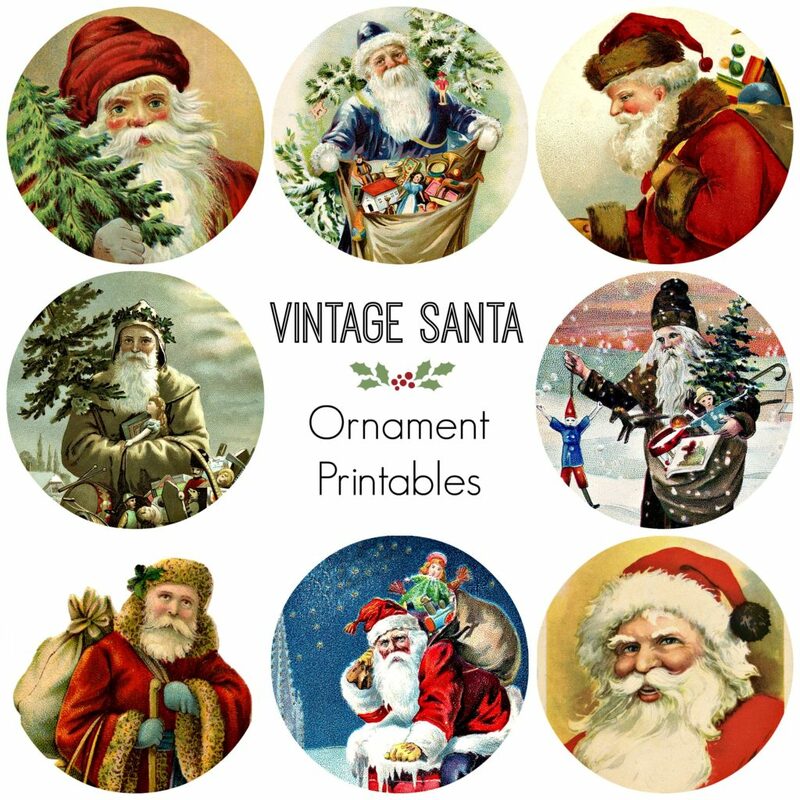 There are a total of 8 vintage Santa prints. Each one has personality and loads of details. Use Mod Podge or a similar glue to adhere the prints onto 3-inch wooden circles you can find at your local craft store. Cut a piece of twine or thin ribbon long enough to make a loop and a little bow. 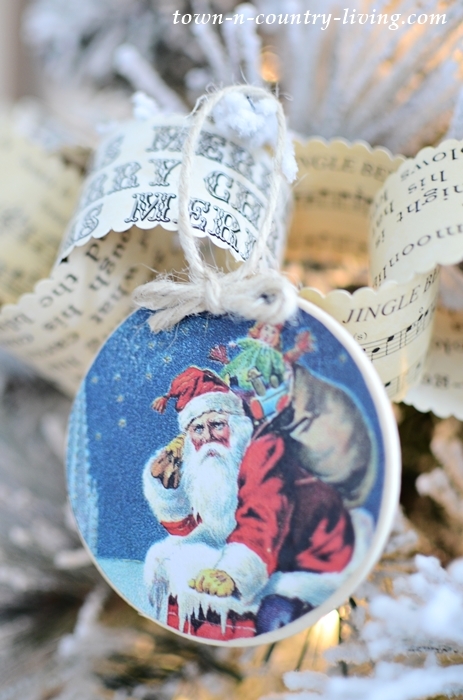 Use a hot glue gun to fasten the twine loop onto the top of the ornament. Be careful not to burn your fingers! 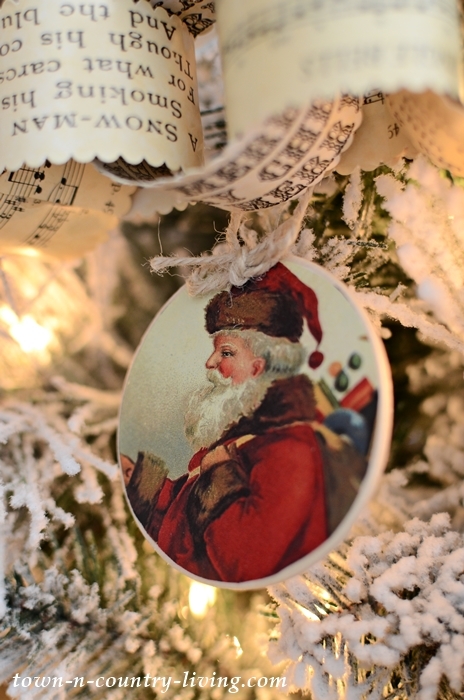 Finally, have fun hanging your new vintage Santa ornaments onto your tree! 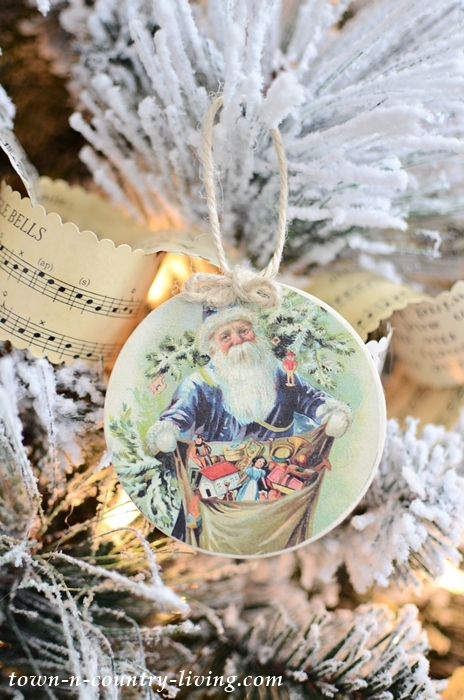 I love all things vintage when it comes to Christmas decor. 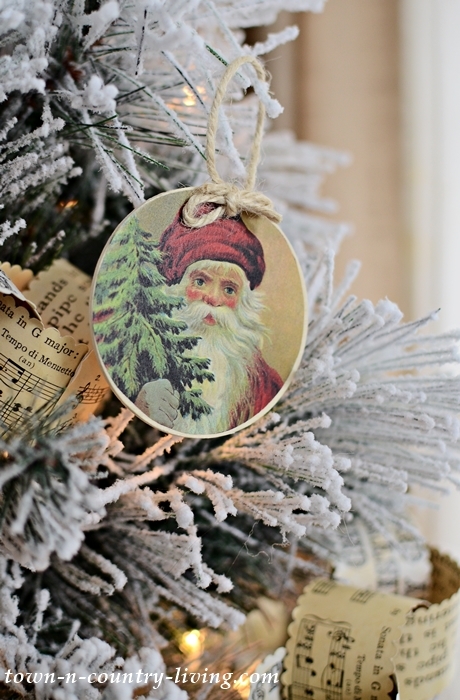 My vintage Santa ornaments have an Old World feel about them that I find so endearing. 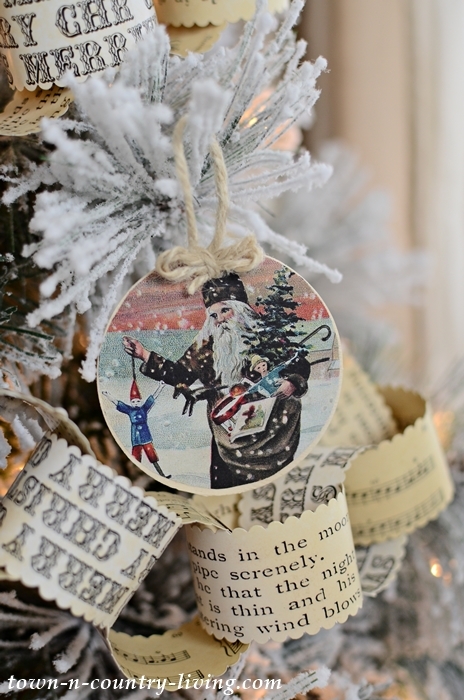 If you’re not a fan of Santa Claus, you can still create these ornaments with any 3-inch circular Christmas print. 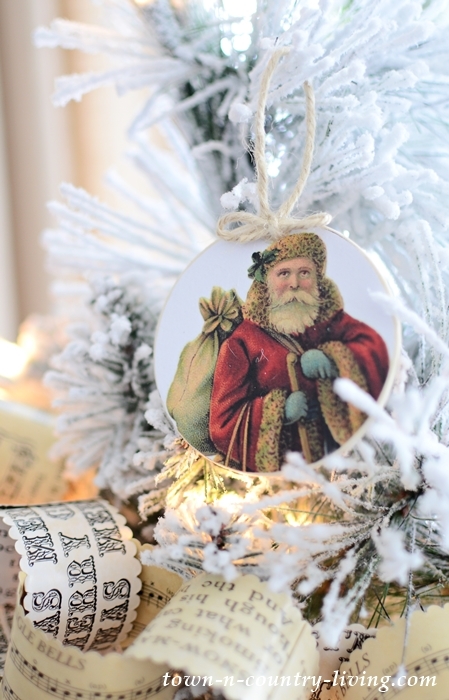 To make your own vintage Santa ornaments, download the printable file here. For more Christmas ornament tutorials, visit my blogging friends below! These are so pretty and love the vintage look of them as well. Beautiful vintage Santa’s. Thanks for sharing! May I ask where you got the chains? Did you make them also? Love these!! I am a huge fan of Santa! I also love the chains and would like to know where they came from? You can also stain the wood circles before applying the Santa. 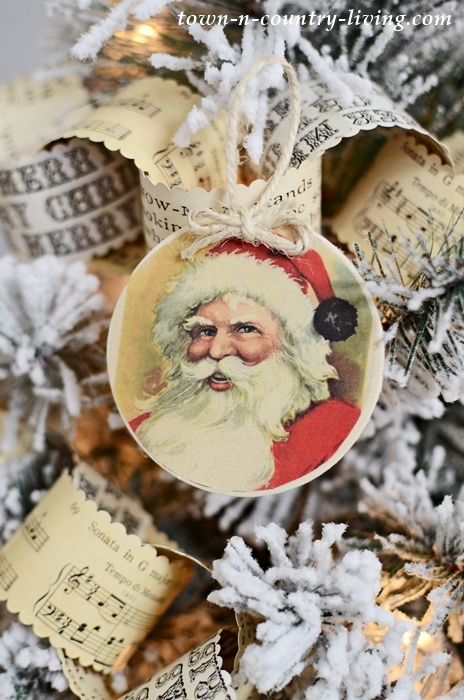 Another idea to make Santa look more vintage is to apply a dark wax, or stain around the edges. These will be so fun, i love vintage Santa’s and these are very good, thanks. I am beyond in love with these Jennifer! Give me all the vintage Santa’s! I’m dying to make these. Thanks for sharing friend! I live the Vintage Santas. 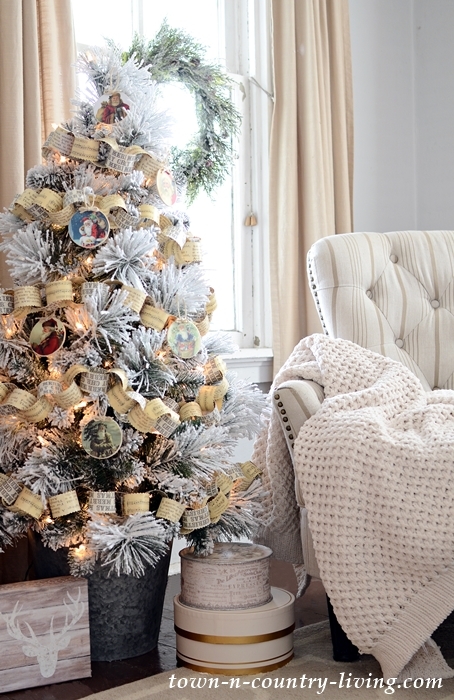 I have been looking for some ornaments test are toddler proof and these ard perfect. Thanks Jennifer. I love your vintage santas. Adorable!